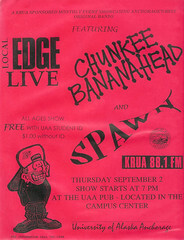 Chunkee Bananahead ruled Anchorage in the summer of 1993. Rising as a joke from the ashes of Jugular Pump – a short demo was recorded in the old Zelenka garage strictly for use on the local college radio station (KRUA). The band name was a play on another popular band in town at the time, Sonic Tractorhead. Shortly after the first recording, Mark Powers went away to boot camp and another demo was recorded with T.C. Ottinger. Same song, different singers, different lyrics. Recorded at the Noise Factory. Recorded in the Old Zelenka Garage. Jack has a rock and a ‘big stick’.